As a customer of Brightcove you have at your fingertips access to tons of resources to help you achieve your goals for online video. I wanted to highlight today perhaps one of the more overlooked resources available to you: The Brightcove forums. On the Brightcove forums you gain access to speaking with other Brightcove publishers about their implementations as well as the ability to ask more technical questions to our team of developers and engineers who monitor the forums closely. 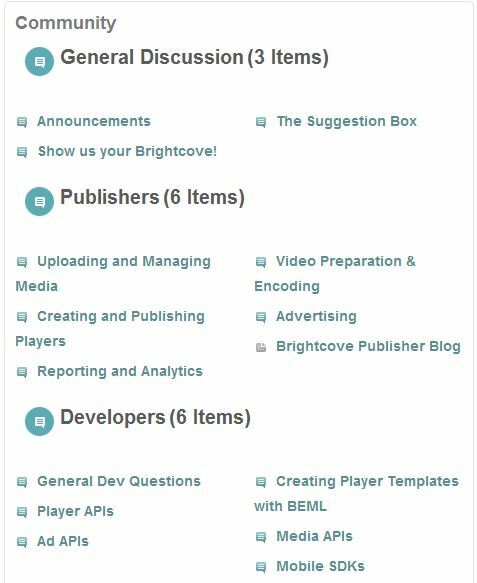 The following is a breakdown of the Brightcove forums and the information you will find there. In the general discussion you can find a few different ways to interact with the Brightcove community. Firstly, if you are looking for feedback on your Brightcove implementation, submit your site to the "Show Us Your Brightcove!" section. Both employees of and Brightcove and customers alike often check these forums and offer feedback and advice. This is also a great sub-forum to check out if you are just getting started and are looking for some ideas of how to implement video on your website. Additionally, please feel free to leave any of your feature requests or suggestions in the "The Suggestion Box". We are always looking to hear feedback from our customers in order to continue to improve our product in the ways that best help you! Do you have specific questions about the Brightcove studio or one of its modules? Feel free to ask in the Publishers section of our forums. Again here you gain access to people with incredible amounts of experience using the Brightcove studio. Allow other Brightcove publishers to give you tips on how to overcome certain challenges or tricks on using certain features. Lastly, for all of our publishers who are developers, have access to developers, or are looking to implement more customized, technical solutions, our developer forums is a great resource to utilize. Whether you have general development questions or more specific questions regarding the Brightcove APIs why not ask the very people who helped build and develop them? While we can't write specific code for you, our engineers would be more than happy to discuss your project and help work through your technical questions. So check out the forums today! Whether you are looking for some quick feedback or have a technical question, why not leverage the entire Brightcove community to give you a hand?